We took a late fall trip to the delightful Casa de Campo Resort and Villas in the Dominican Republic. This is a bastion of Pete Dye golf courses, high end accommodations, good food and drink, and lively entertainment. Over five days we played em all….Teeth of the Dog, Dye Fore, The Links, and La Romana Country Club….and it was just the perfect warm antidote for the November chill that had set in on the East Coast. With business down a bit in what we thought was high season, the powers that be upgraded us from the main hotel to a series of lavish villas across the property. Four to five guys in each, we had our own pool, jacuzzi, outsized living spaces to stretch out, and even a service professional to make us a hot breakfast every morning. We were living the life of a Conquistador. #5 Casa Arriba Villa….Rooms r’ Us……. Living room was perfect for an afternoon siesta nap or a chat with the boys….. Many had a view like this from their porch while enjoying their breakfast……. For the golfing experience it is Dye, Dye, and more Dye….just cannot get enough of his influence, which is understandable since he lived just off the green at the Par 3 7th. Having said that the courses are totally playable for folks of all skill sets. The ocean views on Teeth of the Dog can be somewhat distracting but it fills your golfing heart with pride when you traverse one of those shore lines and land your Srixon on terra firma. Kolman and Harry preparing for the day’s skirmishes……. The first stop on the Dye Tour was his 1971 work on this campus, the famed “Teeth of the Dog”. The course get’s it’s name for the aerial view of the coastline it straddles where the nooks and crannies the holes traverse look like the dentifrice of a German Shepard. This was fine since we had our fair share of representatives of the dental profession. The Par 4 2nd hole has the full compliment of Dye extras…..in this case waste areas surrounded by what look like drift wood pickets…. The 5th is the first of a series of ocean side three-pars…this one is only an 115 yard pitch but that pesky tree front right has great reach…..
World Wide Weber, Doc Kella, and Steve the Wanderer just hangin’ out…. The 7th is one of the truly captivating views of the day….Pete’s vacation home was just to the right of the green so he could witness the follies first hand…. The Fun Bunch-Mish, Doc, Night Walker, and Kounselor Konnor about to take on the back nine coastal holes….soon the smiling will end…. This add-on was a bit of Dye levity off the side of one of the greens….it is kind of what it feels like trying to hit some of these Par 3’s in a big wind……. The hardest of all the hard one shotters…the 16th has two distinct green sections that are connected by a grass boardwalk….there is no backing off this pin…. If it really gets bad you can use this remnant of a landing strip from the old Casa Airport in front of the 18th tee to call in a Med-Vac Helicopter for a quick escape.. The other gem we played was the Dye Fore Course (circa 2007) which is set a bit more inland on a challenging piece of tumultuous property perched above a river gorge running through its center. Pete was up to the task, creating a dramatic but playable set of holes with plenty of risk and reward sewn therein. Doc, Craig, Double-D, and Len The Plumber posing on the 14th Tee…the gorge behind them is in play big time on this stretch of holes…. For the overly ambitious among us there was the opportunity to play additional golf in the afternoons at the Casa Links or at La Romana, a superb private club within the Casa de Campo campus. The former was just a nice toned down Pete Dye experience, but La Romana was 27 holes of pure Pete Dye genius without the benefit of the seaside views. The 8th at Casa Links was a sweet punch bowl style Par 3….getting to the pin was best accomplished using the side walls…..
Mr. Bill, as one of our caddies affectionately referred to him, uses the aura of the Rainbow Halo to insure putting his drives in the first cut…..
Brice shows you where professional power is generated as he unloads on downswing…..this one was about 280 in the air…..
On these guy trips eating is just below golf and just above the afternoon nap in terms of priority. The restaurants across the Casa Resort are all top notch and cover most of the sacred food groups. The adult beverages flow freely as well so the levity of these evenings is enhanced accordingly. The night we ate at the Minitas Beach Club Doc Kella was celebrating collecting his Social Security….the cake was adorned with a Roman Candle that enhanced his tan…. Eating at La Piazzeta was a serious indulgence in all things Italian…. Among the novel amenities that Mike Keiser came up with for his Bandon Dunes Resort right from the get go was a very neat Approach and Putt Course called Shorty’s. Designed by David McLay Kidd, the guy who did the Bandon Dunes Course, this is a full feature short track with architectural detail commensurate with it’s big brother. Built on the back side of the South Practice Range, it is convenient, practical and fun. Holes from 92 to 177 yards with plenty of options in between on each hole, it is a great place to acquaint yourself with long pitch and run shots you will need across the links style and wind blown Bandon Dunes courses. Shorty’s is open from Thursday through Sunday, when the North Range is in use. Truth is you can play the Mini Shorty’s Routing of 1, 2, and 9 any day since they are safely out of the range of fire of the South Practice Tees. The full 9-hole walk is probably less than an hour depending on how much trash talking you do. Best part is that playing Shorty’s costs you nothing at all, it is free to all comers. Just another perfect happy hour activity for you and your buds. The photos below will give you an idea of the architectural interest of this layout as well as the challenge it presents. The distances on each hole are the official yardage plates, though you can pretty much drop the ball anywhere you like on each hole to fit what you are working on. Note that the hole names are based upon my impression and totally the fabrication of this author, not sanctioned by the folks who run this place. Here is where you start. If the green flag is up Shorty’s is fully open, red flag not so much. Brings to mind the 10th at Pine Valley where the front bunker earned the moniker of the Devil’s A-hole. You have to flight something with grip into the right center of this green and hope it hold’s on. As you can see in this reality TV ground level look, recovery from the Devil’s orifice is unlikely. Garo Yepremian would love the look of this one, just split the uprights for 3. This is a good one for working on a 100 yard seven iron pitch and run shot. Just trundle one up the front ramp and let it work to the pin. The Cape Hole was a classic Golden Age design configuration where the green was nestled behind a large body of water not sand. Here you have to work your approach from right to left to avoid the cavernous bunkers and let the slope of the green bring it toward the flag. Close up of the front right bunker also hints how the front ramp will continue to work your approach from right to left. The name seemed like natural to me. Shallow green with a tiny opening between fierce bunkers and a pine tree squeezing you from the right for good measure. The pines behind just complete the full George Crump look. One of the longer carries over this lone pot to a long green that falls away from you. It gets its name from the fact that this green is the closest to the South Range Tees so it is fully potched from ball marks making it resemble the rutty face of a pimply 13 year old boy. You can see how the right half of the green resembles the hood of a VW Beetle making really hard to hold a high approach. Once again this is a good place to work on your long pitch and run out shot, letting the ground do the work. Don’t let the shot wander left because there are two of these blow-out bunkers, much like you would see on the shore holes of Kidd’s Bandon Dunes Course. The shot here must travel across a deep gully to this perched green behind another pot bunker. The bank left of the flag can be dexterously used to feed a shot onto the green avoiding the bunker. 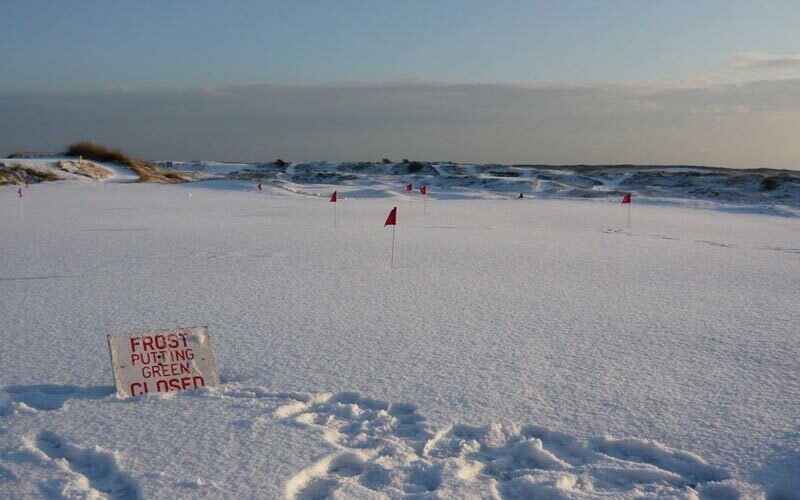 Links golf requires forethought. This green complex of this one honors the Gold Medal accomplishments that dynamic Olympic Beach Volleyball Duo Misty May Treanor and Kerri Walsh. You may find yourself volleying pitch shots back and forth across this raised shallow table top green. The look from the receiving side….equally steep approach back up. The final hole has all the architectural features bundled into it. The layered, ragged edge bunkering from the right reminds me of some of the fairway bunkers on Bandon Dunes. Mounding from the right masks the playing surface from clear view. The green emanates from the hill on the right and has a deep low behind the front mound that will shove timid approaches away from a flag in the back right. Putting this green is an adventure all it’s own. The look from behind shows you the mound that hides the front and the collar bunkering that rings the back waiting to catch an approach with too much enthusiasm. Great holes are often kool looking from either direction. You can see the counter clockwise routing of the course. It follows a tight circle for a very efficient walk, one well worth taking. Mike Keiser did it again. In 2013 he added one more piece of priceless frivolity to what already has to be the complete golf destination in the world. Tom Doak designed the ultimate putting playground called Punchbowl at Bandon Dunes. It has quickly become one of the most popular tickets at the resort, delighting folks of all ages in a kind of DIY-no classroom walls putting experience. This ginormous putting surface (total acreage undisclosed) sits just off the veranda of the Pacific Dunes Grill overlooking the great western pond with 18 holes sprawling across rigorous seaside terrain characteristic of the rest of the resort. Inspired by the Himalayas green at St. Andrews Doak created this with a bit more drastic topography. From the moguls on the big plateau at the north end around the large tree in the middle to the deep bowl on the south end there is an elevation change of as much as 20 feet. Click image to appreciate Josh’s eerie shadow and experience the full Punchbowl panorama. This is a full service putting entertainment facility. Open from 2 pm until dusk (they probably need six hours in the morning to cut this small piece of paradise), there are 100-foot roller coaster putts, Daytona doglegs, and ridiculous topographical transitions that will challenge the most creative mind. Starter’s Stand can accommodate the lines-just drop your ball in the ball slot until it becomes your turn. Note the hole markers have integrated beverage stands…how convenient! As you would expect at Bandon, there is a beverage cart close at hand to wet your whistle or simply calm the putting jitters as required. Drink holders next to every tee and hole location and a course routing that can change every day. Perfect for resolving unsettled wagers from the morning walk, a little fraternal fun with your compadres, or some serious work on the lag putts with the new saw grip. Punchbowl is a necessary add to every Bandon Dunes itinerary. Once again Mike Keiser proves that he knows what we want even if we cannot tell him what it is. The Keepers dedicated our 9th Annual First Tee Mentoring Outing at Woodmont Country Club to the memory of our good friend Arthur Blitz. Arthur was a huge advocate of this event every year and we will recall his smiling face and infectious laugh each year we host this wonderful event. The First Tee of Greater Washington D.C. brought 31 awesome kids to participate in an afternoon of pure golf fun. We had 19 volunteers from our club along with capable professional golf staff as our guides doing golf clinics, a picnic lunch, and a couple of hours of course time with the kids. These kids come every type of background you can imagine and they have gleaned from their First Tee experiences self-confidence, poise, and grace as well as being introduced to the game of golf. It is a wonder to witness the etiquette, course awareness, and basic skills of these 7 to 17 year-olds who attend this event each year. Our volunteers provide the smiles, reassurance, and support to help these kids understand how much this game has to offer. It takes the help of the First Tee of Greater Washington and supportive parents to pull this off each year. To download any photos to your PC just right click on the image and pick “Save Image As” to save it to your computer. Sometimes the mentoring is as simple as a smile or an encouraging word…the kids got lots of both. Best part is just stepping back and watching these amazing kids do their golf thing. All the kids went through the rotation of three clinics-range, short game, and putting-led by our professional staff. There was long game work with Brice and Morgan at the range. Jake and Mike worked on greenside short game skills with all the groups. Dave Pelz has nothing on Konnor…his putting school is a full bag of tricks. Guys synchronized rake putting…who would have thought.. The clinics worked up an appetite so they were followed by a break for a picnic lunch where we got to just sit and chat…..healthy sandwiches, real chips, fresh fruit, and some chocolate chip cookies for the big kids. We were all single digit eaters. Then it was out to the course to put what they learned to work. It is amazing how these kids handle themselves on the course. Fixing ball marks, raking bunkers, marking their ball properly, and respecting the efforts of their playing partners. Shaking hands with the kids and sending them away with a participation certificate and a few goodies to commemorate the event. One last bit of business to thank the volunteers, the golf staff, and the organizers for putting this together. And most important, thanking these adorable and talented kids for being part of this memorable day. Special thanks to Connor Farrell, Steve Keller, Moe Dweck, and Roger Brown and the professional golf staff for all the hard work in assembling this event. Thanks to Woodmont Country Club for graciously hosting this and the First Tee of Greater Washington D.C. for hooking us up with these awesome kids. On a recent buddies trip we had 16 guys spend four invigorating days at Streamsong, the destination golf resort in central Florida. Streamsong has it all, three supreme golf courses, a couple of happy hour extras in a 6-hole approach and putt course as well as a massive recreational putting green, a wonderful upscale hotel with all the accommodation elements you would expect, and food that far surpassed our buddy trip standards. Streamsong sits in the middle of nowhere on thousands of acres of what used to be a major phosphate mining operation. The owners realized that, with the insight of the game’s top design teams, the sandy soil along with the topographical remains of the mining operation could be made into a bunch of very unique walking golf courses that are anything but Florida typical. Typical vista from the the Black Course…..Dorothy can you believe this is Florida? In 2012 the placed opened with the first two courses, the Blue Course by Tom Doak and the Red Course by Bill Coore and Ben Crenshaw making an immediate splash to rave reviews. Having clocked over 30,000 rounds each of these two layouts, the owners opened the Gil Hanse Black Course in the fall of 2017 and it may just be the best of the three of them. The hotel has everything you want in a destination resort-fine restaurants, health club, spa, swimming pool, clay shooting, fishing, hiking, and some pretty good golf. The added bonus, a very casual atmosphere where you don’t need much more than golf casual to do anything you want during your stay. Howard with the catch of the day…..there is a big story to go with this of course! The golf is what you come for and there is plenty of it. Set up for walking you better come with your golf legs fit for action because these are not your typical flat Florida tracks riddled with man-made water hazards. The caddies are a must because all three of these tracks have a wide, tactical character, similar to what you would encounter in Bandon Dunes or across the pond. It is way more than just knowing how far it is to the pin. Bill Coore and Ben Crenshaw are known for the minimalist approach of designing golf courses. They really did not need to move lots of earth here to get a wild and natural look for the Red Course. Delectable provisions available at BBQ Shack at the turn……. They opened the Gil Hanse/Jim Wagner Black Course in the fall of 2017 which added another dimension to what was already a fabulous selection of links-like courses. As we have seen at other resorts they added a couple of Golf Happy Hour facilities to occupy the masses apres round. At the Black you will find a 6-hole Approach and Putt Course as well as a massive recreational putting green called the Gauntlet. It is not the Ladies Putting Course at St. Andrews but, with an adult beverage in hand, it does provide great entertainment possibilities. The Black is a long walk, almost seven miles, because of considerably more distance between greens and tees. The caddies will tell you, it is actually an easier walk because the terrain is much more tempered then it’s Red and Blue Cousins. The bunkering and sandy fairway surrounds on the Black have a very natural feel and, with a wee bit of wind, you could swear the Atlantic is just over the next rise. Devil’s orifice is the lone bunker in front of the 6th green…it is a doozie!! As you come up the Par 4 9th, the signature windmill behind the green, which was reclaimed from the mining days, becomes your aiming point off the tee as well as into the blind punch bowl green. It can be seen throughout the front nine and can be very helpful for ascertaining wind direction, which can be enigmatic considering there are very few trees along the way. Driveable 14th….don’t go long of this extreme green or a 5 will be a difficult score to make…..
A meditative moment for The Mish before pulling the club on the 15th….. The finish on the Black is a stunning cape hole with all the fixins….. The Streamsong experience is one that all golf addicts should experience. The quality of the courses makes it well worth the effort of getting there. The Keepers held our 8th Annual First Tee Mentoring Outing at Woodmont Country Club with 28 delightful kids from every background you can imagine who participate in the programs of the First Tee of Greater Washington D.C. We had 17 volunteers from our club along with the professional golf staff as our guides doing golf clinics, a picnic lunch, and a couple of hours of course time with the kids. These kids come every type of background you can imagine and they have gleaned from their First Tee experiences self-confidence, poise, and grace as well as being introduced to the game of golf. It is a wonder to witness the etiquette, course awareness, and basic skills of these 7 to 14 year-olds who attend this event each year. The almost 50 staff, volunteers, and kids that made this day so special. These guys and gals get as much out of this outing as the kids. Sometimes the mentoring is as simple as a hug or a pat on the shoulder. The mentors share their knowledge and experience of how they have earned their crack handicaps. Best part is just kickin’ back and watching these amazing kids do their golf thing. Then the kids get to show their stuff….as well as their individuality and style. You can work up an appetite at these clinics so they are followed by a break for a picnic lunch where we got to just sit and chat…..healthy sandwiches, real chips, fresh fruit, and some chocolate chip cookies for the big kids. We were all single digit eaters. Starts with an orderly line….followed by a choice….Tuna or Turkey…..
Carina, Sophie, and Avery….are these kids cute or what? Then it was out to the big course to put what they learned to work. It is amazing how these kids handle themselves on the course. Fixing ball marks, raking bunkers, marking their ball properly, and respecting the efforts of their playing partners. One last bit of business to thank the volunteers, the golf staff, and the organizers for putting this together. And most important, thanking these adorable and talented kids for being part of this beautiful day, sending them away with a participation certificate and a few goodies to commemorate the event. Special thanks to Connor Farrell, Steve Keller, John Friedson, Moe Dweck, and Alexandra Uduk and the professional golf staff for all the hard work in assembling this event. Thanks to Woodmont Country Club for graciously hosting this and the First Tee of Greater Washington D.C. for hooking us up with these awesome kids. When people talk about playing golf in L.A. it is always the posh private places like Riviera and L.A. Country Club that get mentioned. But right in the center of town, just off West Pico Blvd above Santa Monica is one gem of a municipal course called Rancho Park. The fountains are period pieces…reminder of a less posh time in L.A. The current course at Rancho Park was designed by William “Billy” Bell in 1949 on the site of an old Herbert Fowler design that preceded it. The course was the home of the L.A. Open back in the 1960’s and has the distinction of being the first place Jack Nicklaus won a check as a professional….around $33 and change. It also has the infamous distinction-memorialized by a meditation bench and a plaque behind the 18th tee-where Arnold Palmer made 12 of the finishing Par 5 in the L.A. Open after splitting the fairway with his tee ball and then hitting four balls O.B. Original plaque details Arnie’s 12 in the final round of the 1963 Los Angeles Open-two into the range and two on to Patricia Ave.
PGA Tour, LPGA Tour, and Senior Tour events have all been held on this track. The list of winners in the L.A. Open at Rancho Park during the period from 1956 to 1972 is a who’s who of great players from the era. They include Lloyd Mangrum, Doug Ford, Frank Stranahan (amateur), Ken Venturi, Arnold Palmer (3 times), Bob Goalby, Dow Finsterwald, Charlie Sifford, and Billy Casper. In spite of it’s municipal conditioning-it’s location means it gets over 100,000 rounds a year-this course has the bones of a championship layout. The back nine in particular has some incredibly cool holes that will challenge you skill set. This was recommended to me by a number of guys who have played the best L.A. has to offer as a place well worth spending an afternoon of adventurous golf. They were not wrong….it is worth letting your hair down, renting a hand cart, and walking this most enjoyable track in the middle of Los Angeles. Our annual celebration with the First Tee Programs of Montgomery County and the Greater Washington D.C. was a day of high energy and fun for over 30 kids and the 20 volunteers who were part of this. The emphasis was volunteers and professional staff supporting the nine principles that are the bedrock of the First Tee Program. These kids come from diverse backgrounds and make it evident by their poise, grace, and self confidence that golf can teach valuable life skills and they “get it”. Our volunteers ages 14 to 85 provided exactly what these kids needed-smiles, reassurance, and support of the development of their understanding of what the game has to offer. From our youngest to our seniors our volunteers were charming and gracious. There were those mugging for the camera…..
….but all had rapt attention to the proceedings. The day’s activities began with some proper stretching and warm-up drills. Stretch the hammies and work the hip flexors. All the kids went through the rotation of three clinics with our professional staff. At the driving range with Geoff they covered the basics of grip, stance, takeaway, and follow through. Some needed firm direction while others needed us to stand back appreciate youthful talent. The second rotation was a clinic on green side skills with Trillium like pitching and chipping. It was about working on technique, visualizing the shot, and listening to the brush of the grass that indicated the proper result. She even gave them some drills they could take with them to work on their own. The last stop was a clinic on the Zen of putting with Connor. This included stroke fundamentals, speed control, and reading direction. Some cool competitions were included as well as proper celebration techniques. A break for a picnic lunch where we got to just sit and chat…..healthy sandwiches, fresh fruit, and some chocolate chip cookies for the big kids. We were all very good at eating. Check out this awesome video of one of the kids making a clutch putt. The group celebration speaks volumes about how much these kids understand about playing golf with your friends. One last bit of business to thank the volunteers, the staff, and the organizers for putting this together. And most important, thanking the kids for being part of this beautiful day, sending them away with a few goodies to commemorate the event. Special thanks to Connor Farrell, Steve Keller, Moe Dweck, and Alexandra Uduk for all the hard work in assembling this event. Thanks to Woodmont Country Club and their professional staff for hosting us and the First Tee Chapters of Montgomery County and Greater Washington D.C. for hooking us up with these great kids.